Avoid what you don’t understand – Whether it is business planning, Internet marketing, or appreciating the difference between order taking and sales, it is a good bet that the skill set that helped start the business will not sustain it. 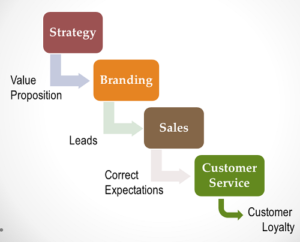 Many business owners forego writing a business strategy because they do not appreciate that the underpinning of all marketing activity is built on the business strategy. If one can answer these questions, “Why are we in business?”, “Why will people buy from me rather than my competitors?”, and “How much revenue can I capture from this market over the next three years?” their business plan will be better than most of corporate America. The fundamental skill is engaging customers and prospects so to understand what they want and the trends that are driving their interest. This skill comes naturally to a small group of gifted people. The rest of us need to learn a process and practice, practice, practice. Avoiding development of high-skill employees – The skills and traits that make managers and sales professionals successful are almost identical. The most important of those skills are leadership and interpersonal skills. When I talk to business owners about how they evaluate sales performance, the most frequent response is, “My folks are very experienced.” While this response dodges the question, interpersonal skills are usually developed with maturity and growing self-awareness. In the sales world, experience can be a two-edged sword. On-the-job experience needs to be balanced against how professionals have updated skills to remain relevant with the changing nature of sales. 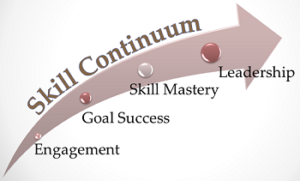 Skill development does follow a logical progression. A sound “on-boarding” process should engage an employee with the position and company. Skill in setting and managing goals will accelerate development of interpersonal skill. Development of interpersonal skills requires modeling of desired behaviors and coaching employees on how to achieve results. While engagement and goal management can be measured with surveys and percentage of goals achieved, evaluation of interpersonal skills and leadership require close observation to verify desired skills. Misconception that the value is the product– Pride in company and product offerings is almost always a good thing. Customers, however, focus on what value they might gain by consuming the product rather than the product itself. Customers’ perceived value can only be fully understood by objective, yet empathetic inquiry with the customer. Again, interpersonal skills are essential for sales and marketing staff to understand current and future customer wants. Business leaders that shy away from developing interpersonal skills will shy away from gaining adequate customer focus. Accelerated Achievements is an advocate for Marketing Quality Management (MQM). Lasting improvement is achieved through a comprehensive assessment of process, people, and skills and implementing real-time performance measurements. Please contact us, and we will be happy to share ideas on how you can upgrade your marketing capabilities.